hum creative || This is Generic Dot Cx. 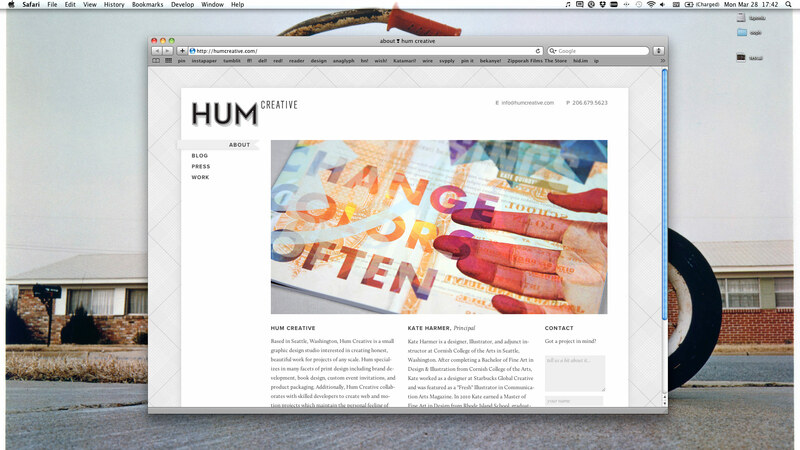 I developed kate harmer's humcreative.com website recently. The site is mostly a portfolio site, but it includes lots of small treats, like history pop/pushstate for browsers that support it, and multi-column text, css animations and all those cute buzzwords. The site also has lots of random backend things built in, like tumblr api-integration for pain-free blogging and html multi-part contactform emails. The vast majority is structured off a customized fork of the html5 boilerplate + stacey 2.2 that i work on. The site is easy to maintain and was a blast to work on. Here's the website in action. Notice the address bar behavior which updates even though the page doesn't actually reload. The blogs are powered by tumblr and comments come courtesy of disqus. Another subtlety is the galleries which vary for print work and web work, where the images transition on the laptop.